India's Born Again nationalists consciously ignore their ideology, ideals and intellectual inheritance. Our nationalist icons are often dragged into current political debates, mostly by those who have little to do with them – or with their politics during the freedom struggle. Two of them, Netaji Subhas Chandra Bose and Shaheed Bhagat Singh, have been invoked by the right wing political groups during the past two years. The tragedy with the right is that its unique selling proposition in politics is nationalism, while its share in creating a plural nationalist ethos, particularly since 1925, is abysmally poor. This leaves the right with no credible nationalist icon to look up to and their only option is to hang on to the most popular ones at the slightest opportunity. These icons are conveniently reduced to being just nationalists and "martyrs", with no reference to their ideas and politics so as to somehow fit them into the current right wing politics of nationalism and slogans. "Terrorism is never the object of revolutionaries, nor do they believe that terrorism alone can bring independence." "effective means of retaliation. The British government exists, because the Britishers have been successful in terrorising the whole of India...Only counter terrorism on the part of the revolutionaries can checkmate effectively this bureaucratic bullying." Only those who read history in its present context can see the tag of terrorism as an insult to Bhagat Singh and others, when for them it was actually a strategy to fight, which they later realised would not work. More demeaning is the total neglect of his ideas in the current right wing imagination of Bhagat Singh. To just call him a "nationalist and a martyr" is incomplete – he was much more than that. Our born again nationalists consciously ignore Bhagat Singh’s intellectual inheritance. For them, it is politically savvy to venerate him as a martyr but not worthwhile to appropriate him as a philosopher and a revolutionary thinker. It has always been intriguing that Netaji papers remained under wraps during all these decades. It created a mystique around his disappearance and generated huge controversies. However, if not a damp squib, the declassification did fail to ignite the expected fire, though it managed to silence all those who had almost made an industry out of it. Even Chandra Kumar Bose, Netaji’s grandnephew, was snubbed by the electorate in West Bengal despite his decades-old engagement with the mysteries around Netaji. But again I am more interested in the ideals Bose espoused, particularly in the 1920s, one of the most crucial decades in our freedom struggle. Subhas Chandra Bose and Jawaharlal Nehru had formed the Independence League and were aggressively campaigning to mobilise the youth. Bose was invited by the Naujawan Bharat Sabha to deliver the presidential address in its Karachi session in 1931. It was held simultaneously with the Congress session, which met under the shadow of the hanging of Bhagat Singh and his comrades two days earlier. We also need to be aware that Bose spoke all this in the midst of slogans like Inquilab Zindabad and Down with Imperialism. Nationalism is not empty rhetoric – it can’t be flaunted by mere chest thumping or even by branding some fellow citizens as anti-nationals. Bhagat Singh and Subhas Chandra Bose were nationalists because they had a serious vision for nation building. They were in the vanguard of our freedom struggle and not engaged in some apolitical and safe socio-religious reform programme. Our pluralist nationalism is an inheritance from our freedom struggle, which could only be articulated after decades of churning and was later defined in the Constituent Assembly Debates. S Irfan Habib is a historian and author who lives in Delhi. 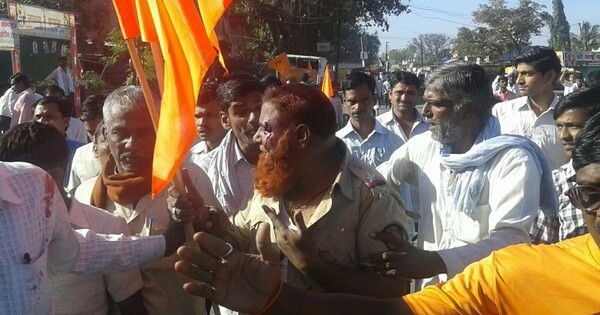 Was the attack on a Muslim cop in Latur a communal incident?